Every Allen Organ is a hand-built masterpiece. Using solid lumber, quality furniture construction methods, and computer design, each instrument is built to last a lifetime right here in the United States using American-sourced materials. Skilled craftsmen shape these beautiful instruments to exacting standards using a combination of computerized design and old-world woodworking skills. Allen Organ owns its own electronics and component manufacturing facility, housed on-site at the Allen Organ factory in Macungie, PA. Even the metal cages which house components inside the organs are manufactured right in the Allen factory. This commitment to quality ensures that each component in the organ is designed and built to withstand the test of time. 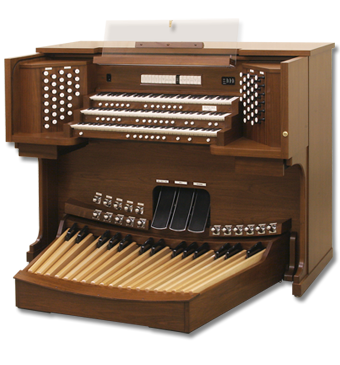 Professional organists and those who appreciate the quality difference prefer Allen Organs. There are over 70,000 Allen Organ installations, worldwide, on all seven continents. Locally, Amro Music (and formerly, the Keyboard Place, which merged with Amro Music), have installed hundreds of Allen Organs over the last forty years in Memphis and the Mid-South. Notable installations include several large hybrid organs (digital console, speakers, and true organ pipes) in West Memphis, AR and Tupelo, MS, and the world’s largest Allen Organ, the five manual custom Allen at Bellevue Baptist Church here in Memphis. Allen Organs are proven workhorses for smaller churches, also. There are literally hundreds of new and experienced Allen Organs that fit the needs of 50-, 75-, and 100-member congregations throughout the Mid-South. Whatever the size of your church, there is an Allen that will inspire your musical worship and bring joy to the congregation. Each Allen Organ can be outfitted with an array of advanced capabilities, including MIDI capabilities, Allen’s Vista Navigator, GeniSys voices, and many other options. Every Allen comes standard with voicing controls that allow us to adjust the organ’s balance based on the needs of your sanctuary or home space. Drawing on five hundred years of proven methodology, this is a unique feature that no other competitor can match – the ability to voice the organ just as a pipe organ builder would. 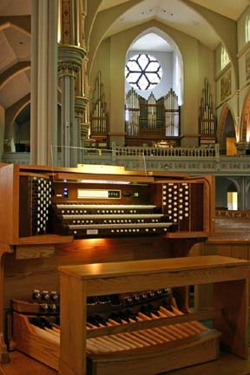 In addition, many Allen Organs can be outfitted with multiple stop lists, organ suites captured from organs around the world, and the ability to control other keyboards, making the organ relevant for contemporary worship settings. In short, every Allen has the versatility needed to meet the demands and expectations of today’s musicians and their varied musical programs. Allen Organs are the world’s most reliable organs. And, because Allen maintains its own components manufacturing facilities and over $4 million in parts inventory, Amro Music has access to parts for any Allen Organ ever built. This ensures that in forty years, we and Allen Organ will be able to provide service for the organ you install today.